Guest blogger, GPO Public Relations Specialist Emma Wojtowicz, reviews a new publication giving the “Fast Facts & Figures” about the U.S. Social Security System. The Federal Government offers many publications to educate and inform the public. If there is a topic that interests you or that you want to learn more about, Government publications are a great resource. Not all publications are long, dense and written as legal briefs. Fast Facts & Figures About Social Security, 2011 is a 36-page booklet that accomplishes what the title suggests – providing readers with fast facts and figures about Social Security. Social Security is always a hot topic with election-year fact checkers, and this annual publication does a good job breaking down the information so the reader can understand and better grasp this important topic. The introduction describes the publication as a “chartbook” which it is with at least one chart, graph, or table on each page. This is a smart way to present the information because it allows the reader to gain a lot of knowledge from just scanning each page. Like most Government-related publications there are many acronyms that readers are not familiar with, luckily, this publication includes a list of abbreviations and acronyms on the second page which is helpful for understanding the content, such as OASI which stands for Old-Age and Survivors Insurance. The data focuses on Social Security programs for retired workers and their dependents, disabled workers and their dependents, and survivors of a deceased worker, which benefits or assists over 59.2 million Americans. Of all adults receiving monthly Social Security benefits, 44% are men and 56% are women. The recipients of Social Security benefits are 64% retired workers, 15% disabled workers, 12% survivors of decreased workers, and 9% dependents of a retired or disabled worker. The average Social Security benefit for a worker who retires at full retirement age is $1,176 per month, and the maximum Social Security benefit a worker who retired at full retirement age can receive is $2,366 per month. The average Social Security benefit for the children of a deceased worker is $750 per month. Social Security is financed from three sources: 82% from payroll taxes, 15% from interest earned on Government bonds held by trust funds, and 3% from income taxes on Social Security benefits. For 73% of single elderly (nonmarried aged) beneficiaries (and 54% of elderly couples receiving benefits) in 2011, Social Security provided at least 50% of their total income. 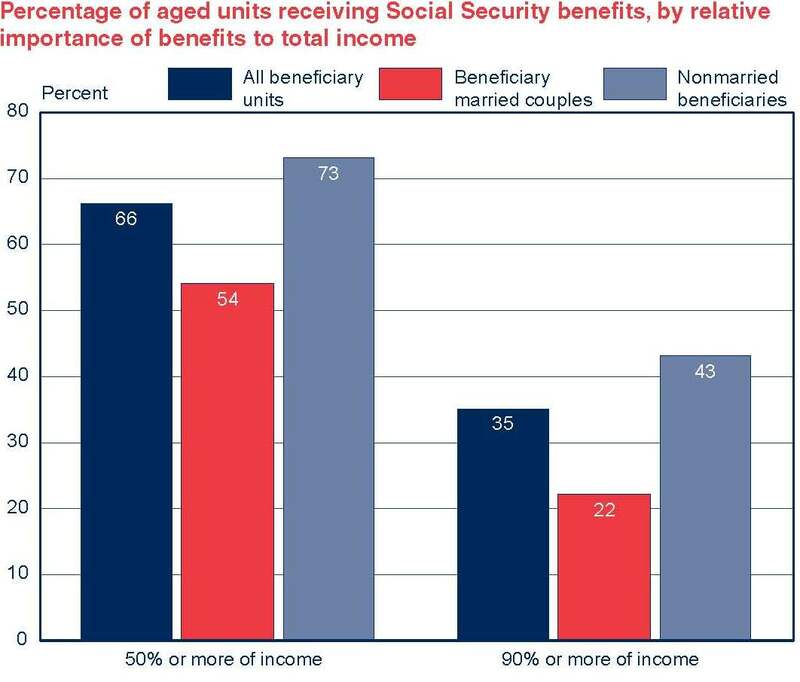 Social Security benefits make up over 90% of the total income for 43% of single elderly recipients (and 22% of elderly couples), making Social Security benefits a critical source of monthly income for them to live on (See image below). The one downside to this publication is that is does not thoroughly explain how Social Security benefits are calculated for recipients; there is a benefit formula, but it is not easy to understand. Despite that negative, the publication provides thorough data in an easy to read format that helps familiarize readers with Social Security. HOW MAY I OBTAIN “Fast Facts & Figures About Social Security, 2011”? Buy it online 24/7 at GPO’s US Government Online Bookstore.